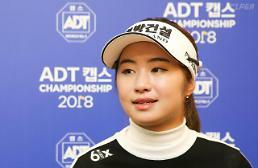 SEOUL -- Buoyed by an "unbelievable" sponsorship deal, Park Sung-hyun, a South Korean LPGA star player, spelled out her lifelong goal of achieving the Career Grand Slam, saying she targets five wins including a major championship in the new season and probably the first place in the world's rankings. "I can't believe I am a player who can be treated like this," Park told reporters Thursday after signing a two-year sponsorship deal to wear the logo of Solaire Resort & Casino based in Manila. 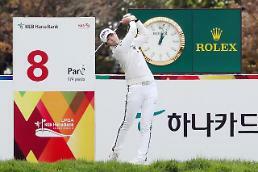 Park's agency, Sema Sports, said her payment would be the highest as a female golfer. There have been unconfirmed news reports that she would get a total of seven billion won ($6.2 million) for two years. Park, 25, won LPGA's Rookie of the Year Award in the 2017 season. She won three tournaments including a major title at the KPMG Women's PGA Championship in 2018. She is currently ranked second in the women's world golf rankings after Ariya Jutanugarn of Thailand. Discontent with her performance in the last season, she aims to score at least five wins including one major title. "I feel good overall, including shots, because I completed my training well." "The Career Grand Slam is also a goal in my mind to achieve," She said, adding she is ready to take on Jutanugarn for the world's top post as she thinks a neck-and-neck competition will encourage the progress of the two players. "I thought that I would like to go back to the top in the world while practicing, and (Jutanugarn) would have practiced with the desire to keep her first place. It was a great help for me to practice with such thoughts." Park voiced satisfaction with TaylorMade's putter and driver, saying she was able to increase her driver distance on tips from Tiger Woods, a living golf legend, who asked her to move the ball to the left. "I practiced on his tip and learned how to find a good timing with a ball on the left," she said, recalling that she had a "trembling" moment with her childhood idol when they met to film for an advertisement together at the Medalist Golf Club in Florida. "I will never forget that day until I retire."